We spent 5 days in Rome - the longest in any city on this trip. It also was the last stop in Italy. Leaving Rome and (and Italy in general) was really hard - we had gotten so used to a certain pace of life in Italy and fallen completely in love with it. In Rome, more than any place, there is this tremendous sense of history co-existing with the modern world. For example where the Circus Maximus once stood they now hold concerts! You can still see the outline of the race tracks that were once there and it just feels so wonderful to know that it is still used as a place of entertainment - as it has been for literally thousands of years. This is the biggest tip I can give you for Rome. If you're going to go to the ancient sites (the Colosseum etc.) 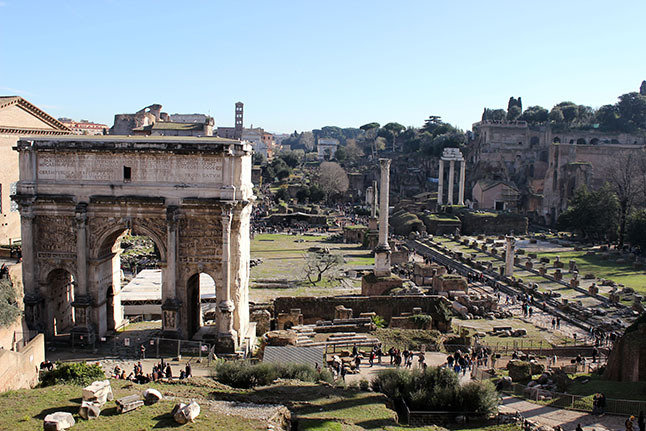 buy your tickets at the Roman Forum - there is never as much of a line as there is for the Colosseum and you can buy a ticket for the Colosseum, Roman Forum and Palatine Hill all at once. The Roman Forum is incredible - we were there on probably the coldest day of the year (it was -3 at lunch time) but it was sunny and just spectacular. So little remains really - so try as you might you can't quite get your head around the scale of it. I would be looking at a column that's wider than a tree and realise that there were once twenty identical columns lining the avenue I was standing on. It would have been grand on a scale you can't imagine. One of the things that always surprises me about travel is the things people and travel guides never mention. For example, did you know above the Roman Forum is a beautiful manicured garden that was built in the 17th century. I had no idea it was there, and it was lovely. I even saw a rabbit! I have a motto for travel "Always have a reason to go back" - so when we didn't make it inside St Peter's or the Vatican museums I just shrugged and said "Oh well, gives us a reason to come back". We did go to St Peter's Square though on our first day and it was nothing like I expected. I pictured walls or guards or something to delineate Vatican City from Rome itself but there was nothing, you just walk in and you're in another country. It's so surreal. There are so many museums in Rome you're really spoilt for choice but I don't think you can really go past the Musei Capitoline - established in 1471 it is the oldest museum in the world. What makes it so interesting is the way it is structured - it tends to stay away from the European tradition of rows and rows of statues (which, let's be honest, can get tedious). Instead you get an interactive history of the hill the museum stands on, and this isn't just any hill - it's integral to the history of Rome. There's even the remains of an ancient temple built into the museum itself. The Piazza Navona is home to the Fontana dei Quattro Fiumi - a fountain depicting the 4 main rivers of the world; the Nile, Ganges, Danube and Plate. My favourite memories of the Piazza are of getting our morning cappuccino (at the bar of course) or enjoying lunch in one of the restaurants. We would look out over the square and enjoying watching the tourists, buskers and one day - a circus troupe! I know travel guides say to stay away from the big squares for food but we liked it - it was simple and yummy and it was good fun to be in among the action. We stumbled on this place completely by chance. We were on our way to some gardens and we stopped to admire some ruins that had been excavated below street level - when we saw a cat. And another one. And another one. Suddenly we realised that there were cats everywhere. Some of them were even coming up for a cuddle - we gave them a pat and went on our way. That night I had a poke around the internet and discovered it was actually a cat sanctuary! In the middle of Ancient Roman ruins! 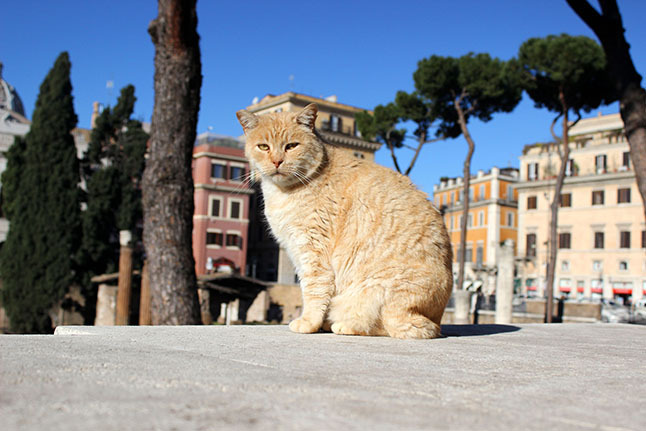 In fact, it's where Julius Caesar was murdered (and legend has it that he was the one who introduced cats to Rome in the first place). The next day we went back to have a proper look and met the people who run the sanctuary. Mike and I fell head over heels in love with a sweet little kitten called Arya - we had to leave before we adopted her! I definitely suggest visiting if you love animals - it's so heart warming to see how well loved these strays are. Mike and I went for a long walk in these gardens on new Years Day - although it was the middle of winter it was still really pretty. Plus if you exit near the Spanish steps you get the most incredible panoramic view of Rome. Honestly, I don't have anywhere specific for Rome - I know, it seems so insane - but we just kind of wandered into places that looked nice/where they heckled us. We ate in a tiny by the slice pizzeria on the way to the Vatican, a place called De Niro after Mr Robert De Niro (with a freakishly giant pizza oven), a proper red and white checked table-clothed pizzeria, multiple gelatarias (yes, in the middle of winter) and so many of the tourist restaurants in the big piazzas. We just had fun being tourists in Rome really - and to be fair, if you're going to go with tourist food Italy is probably one of the better places to do it. Deb of Smitten Kitchen (whose taste in food I trust completely) has a few suggestions from her trip a year or so ago that I sort of wish I had looked at before we went - ah well - next time.